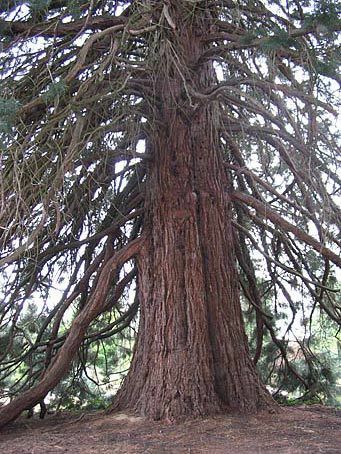 This giant sequoia was found as a seedling tree along the railroad tracks by Sister Protasia Schindler in 1893. She planted it in front of the Queen of Angels Monastery to give some life to the grounds. 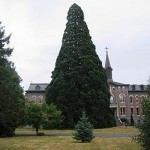 Not knowing what type of tree it was, nor how large it could grow, her tree has become a stunning landmark. The Benedictine Sisters of Mt. Angel were established in Oregon in 1882 by a small group of Sisters from Switzerland. In 1887, construction was started on the Monastery. 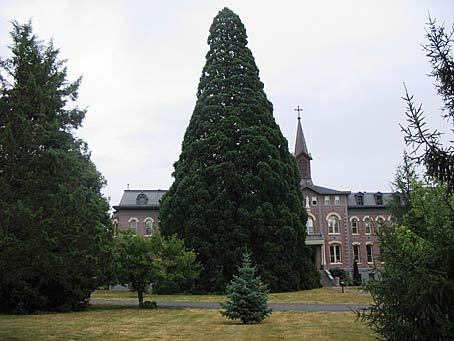 This majestic sequoia has been a living witness to most of the monastery’s long history and now presides over grounds populated by hundreds of other trees. 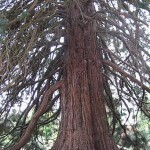 This tree is located just a few feet from the front door of the Benedictine Sisters monastery in Mount Angel.